The course will take you through classic Florida terrain. You will start off on a flat packed trail along Mac Lake. Then you will enter into a narrower trail winding through lush greens, longleaf pines and hardwood hammocks. From there, our courses will split as each distance will get to experience a slightly different scenery and terrain. Our courses are very well marked and runners will be on well-worn footpaths; the paths are mostly grass with some areas of dirt, pebbles, and paved roads. 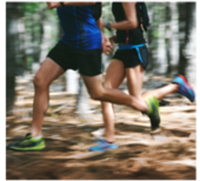 We look forward to providing you a great balance of showcasing our natural Florida beauty and a challenging trail run.